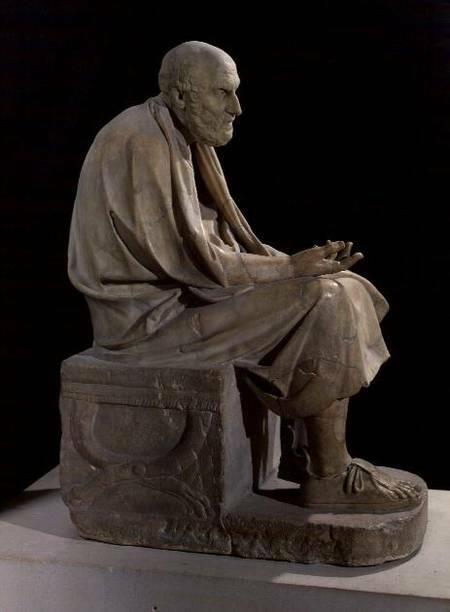 Chrysippus (279 – 206 BCE) was the third master of the Stoic school, after Zeno and Cleanthes, but he is known as the second patriarch of Stoicism because he wrote extensively systematizing Zeno’s teachings, saying to Cleanthes, “Give me the principles, and I will find the proofs myself”. Originally from Ionia, he moved to Athens as a young man where he found Cleanthes and the Stoics. He wrote hundreds of works, all of which are lost, only fragments surviving in the works of others. While Chrysippus also developed the physics and ethics of Stoicism, he is most famous for his contributions to Logic. The Stoics learned much logic from Aristotle, but they found his syllogistic forms insufficient for dealing with all meaningful propositions. While Aristotle’s syllogisms make use of ‘If’ and ‘then’, they do not deal with common conjunctions such as ‘and’, ‘or’, and ‘because’. Modern European logic, based on the work of Frege, Russell, and Wittgenstein, made use of these sorts of conjunctions. Above is Wittgenstein’s truth table for demonstrating how ‘and‘ works. If p and q, which stand for complete statements, are both true, then “p and q” is also true. If either p or q or both are false, then “p and q” is also false. Chrysippus also used conjunctions to make probabilistic statements, such as ‘more likely than’ and ‘less likely than’. He also studied paradoxes, like those of the Eleatic Zeno, and logical fallacies. In ancient Greece and Rome, Chrysippus was as famous a logician as Aristotle for his work, but because the Neo-Platonists took up the logic of Aristotle, Plato’s student, and not Stoic logic, it was Aristotle’s logic that became famous in the Islamic Golden Age and Medieval Europe. It was only with the development of modern logic that Chrysippus’ genius was again recognized.